HOMANN HEIRS. -Americae Mappa generalis..
HOMANN HEIRS. - Americae Mappa generalis..
Americae Mappa generalis.. - HOMANN HEIRS. Size : 18.3 x 21.1 inches. / 46.5 x 53.6 cm. Description :Johann Baptist Homann's well-engraved map has a large decorative cartouche. 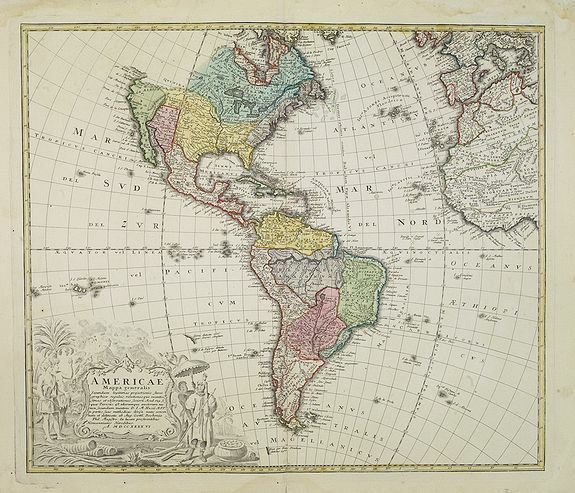 Detailed map of the western hemisphere. Johann Baptist Homann (1663-1724) was a German engraver and publisher, who established himself and his family as perhaps the most famous German map publishers. Following his death in 1724, the business continued under the name Homann Heirs . Condition : Marginal water staining. Good impression.